Skalite 2015 Award to Çelebi Ground Handling in Airport Ground Services category. Skal International Istanbul Club has given 2015 SKALITE-QUALITY AT TOURISM-Awards during the ceremony held on December 19, 2015, at Istanbul Haliç Congress Center. 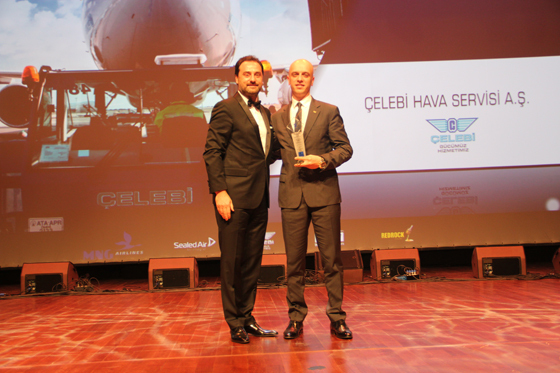 Çelebi Ground Handling awarded with the Skalite Award in “Airports Ground Handling” category. Mr. Atilla Korkmazoğlu, Çelebi Aviation Holding, President Ground Handling & Cargo (EMEA) received the award on behalf of Çelebi Ground Handling Employees during the ceremony with the emphasis on themes “Peace” and the Turkey’s cultural values have been emphasized.